Posted on October 8, 2018 at 1:52 pm. Collaboration to expand customer access to MRI, CT and Angiography imaging technology to effectively treat more patients. 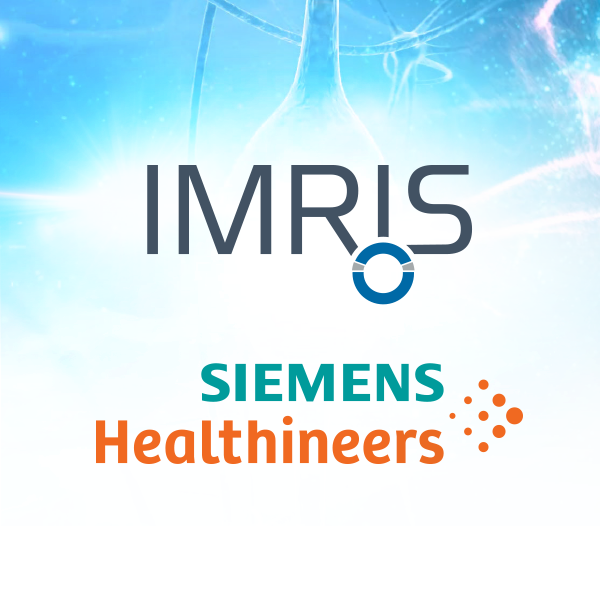 Minnetonka, Minn., October 8, 2018 – Today IMRIS, Deerfield Imaging, in partnership with Siemens Healthineers, announced a strengthened collaboration, enabling both companies to leverage their areas of expertise to advance in the growing multimodality hybrid OR neurosurgical market. 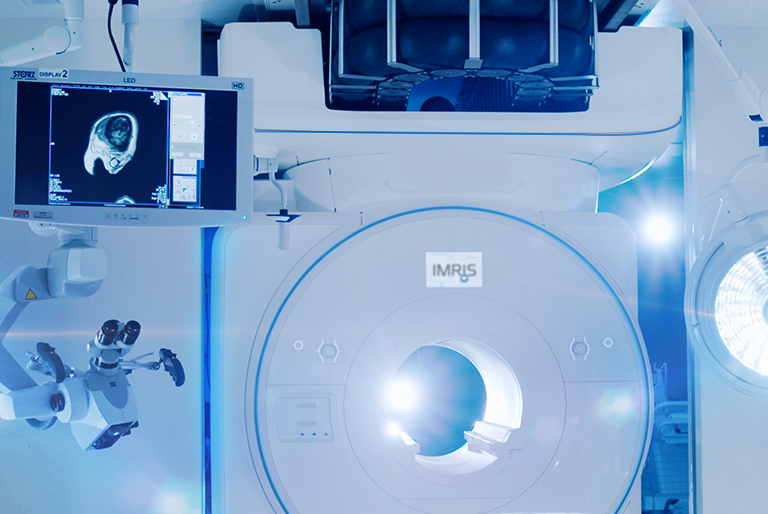 IMRIS will support the sales of both the IMRIS ceiling-mounted and Siemens Healthineers fixed options for MRI, CT and Angiography imaging modalities. 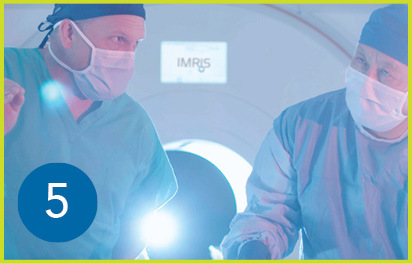 IMRIS offers the world’s only moving ceiling-mounted intraoperative magnetic resonance imaging (iMRI) or computed tomography (iCT) imaging modality, allowing neurosurgeons to see critical anatomical detail while the patient is on the operating table. 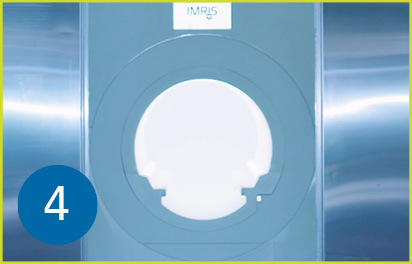 IMRIS’ moving iMRI solution provides surgeons the capability to bring advanced imaging technology to the patient rather than moving the patient in and out of the operating room. This innovative technology provides neurosurgeons greater precision and accuracy during surgery, reducing the need for additional operations and reducing the possibility of complications associated with moving the patient. Posted on February 26, 2018 at 11:21 am. The hybrid surgical environment is evolving. Now, clinical support is evolving with it. Introducing IMRIS’ new Premium Clinical Support, the industry’s most comprehensive intraoperative support solution. We are a highly experienced team of clinical application specialists, leveraging our ‘hybrid’ expertise of both imaging modalities and surgical environments to elevate not only the medical experience… but the human experience. 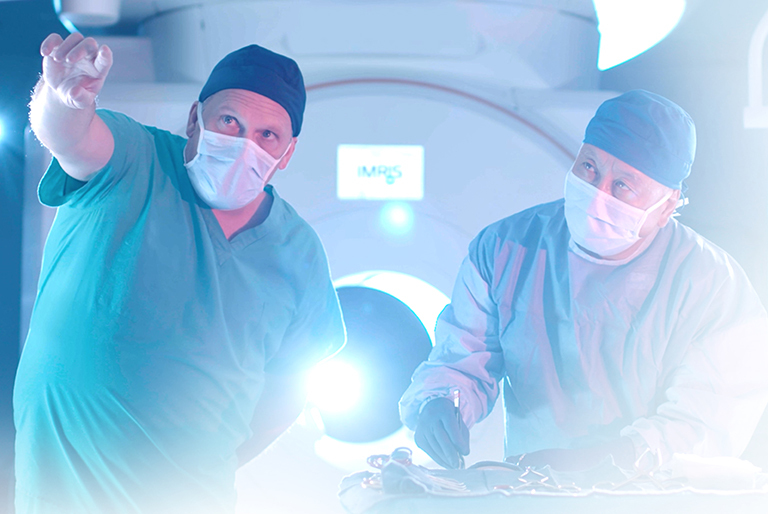 We help introduce new technologies into your specific workflow, including intraoperative MRI, CT and Angio. As the medical world evolves and disruptive innovations emerge, we leverage our knowledge of your specific workflow to integrate groundbreaking technologies into your hybrid surgical theatre. We educate clinical staff on intraoperative safety, best practices, equipment-usage, and clinical workflow efficiencies. Introducing staff to new technologies. Maintaining sterile fields during imaging. We provide real-time consulting during procedures. Our clinical application specialists often consult surgical teams during operations, leveraging our ‘hybrid’ skillset to implement intraoperative imaging in real-time surgical situations. 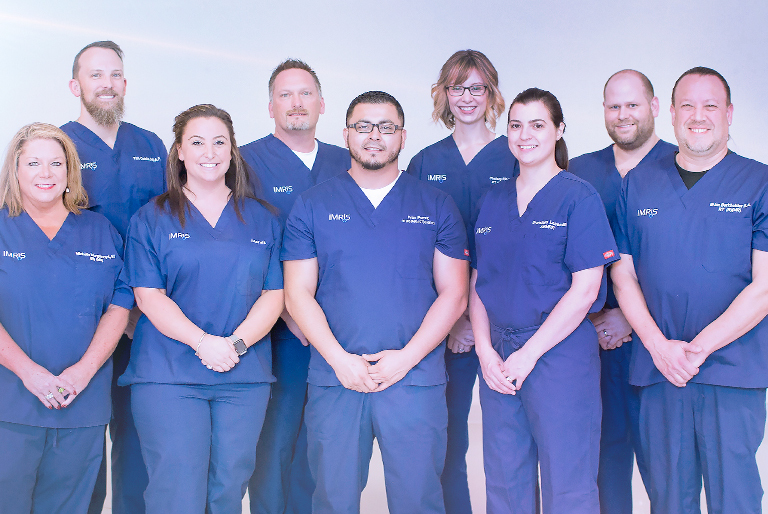 We maximize surgical time with a robust clinical support team. 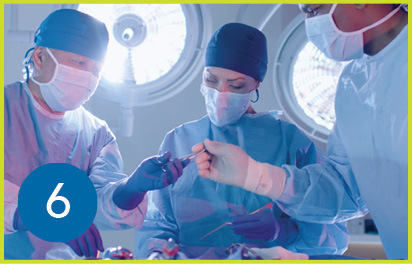 IMRIS offers comprehensive technical support – available at all times to resolve technical issues and maximize the use of your hybrid IMRIS Surgical Theatre. Ballet: A Story from the Theatre. Posted on December 11, 2017 at 10:07 am. Today, as her parents sit in the waiting room, a surgical team will perform an operation that could save this young patient’s life. On their side is an ensemble of groundbreaking technology and human-centric design. This is the kind of story surgeons experience every day in The IMRIS Surgical Theatre. 1.) Today, a young patient is undergoing a tumor-resection in Operating Room 1. 2.) As the clinical team operates, radiology scans several patients in the Diagnostic Room, separated from the two adjacent ORs by sliding doors. By enabling radiology to run diagnostic imaging during the operation, the hospital makes full use of the magnet – maximizing their return-on-investment. 3.) At this point, the surgeon believes they have removed the tumor, and it looks like the operation is a success. However, before concluding, the clinical team will scan the patient with the moveable iMRI – ensuring maximum resection. The team prepares the OR for the magnet, using the Gauss Line (a semi-circle painted on the OR floor) as reference to position equipment. 4.) The bay doors open. Using the unique hanging rail system, the moveable iMRI moves to the patient, who’s in optimal scanning position on the IMRIS Surgical Table. By moving the MRI to the patient – rather than moving the patient to the MRI – the risk of trauma & infection is significantly reduced. 5.) The iMRI scans the patient and quickly returns to the magnet bay. Meanwhile, stationed in the Control Room, radiology prepares a report for the surgeon. The results are in; more of the tumor will need to be resected. The procedure will take longer than anticipated; but, in this case, the patient won’t have to return for an additional operation, which would have exposed her once again to the inherent risks of neurosurgery. 6.) Throughout the operation, a separate team has been preparing for a procedure in Operating Room 2. This time, the team will perform laser ablation on an infant patient, one of the many cutting-edge, minimally invasive procedures made possible with intraoperative imaging. This is the kind of story the world’s leading neurosurgeons experience every day – thanks to the consulting, design, creation and support services provided by IMRIS. 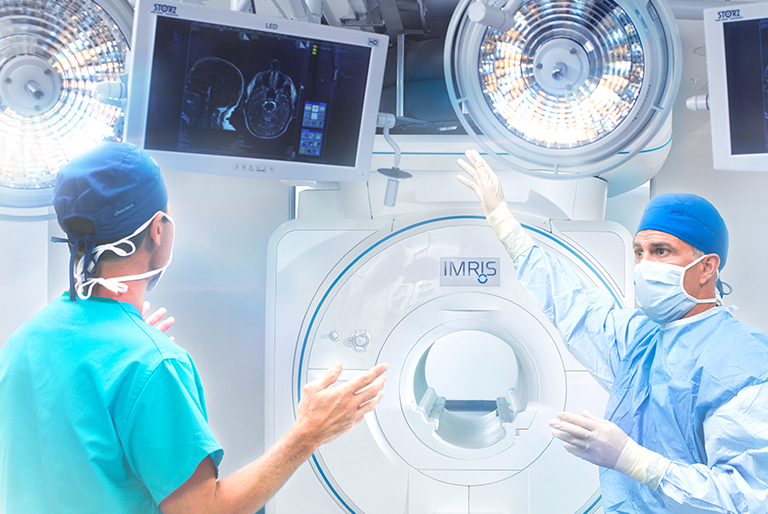 At IMRIS, we’re bringing optimized workflow to surgeons, better outcomes to patients and maximum value to hospitals. Click here to learn more. 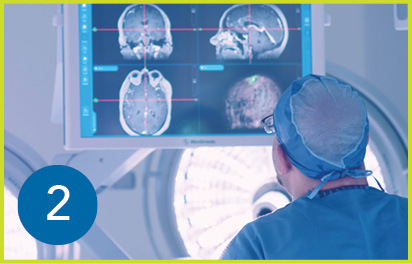 Optimize Your Neurosurgical Workflow. Elevate the Human Experience. Posted on November 28, 2017 at 10:38 am. with IMRIS, the global leader of intraoperative imaging solutions. ACHIEVE BETTER OUTCOMES WITH GROUNDBREAKING INNOVATION. Ideal for neurosurgery, the world’s first & only “moveable” intraoperative imaging solution provides diagnostic-quality images at any point of the procedure – without the risk of moving the patient. 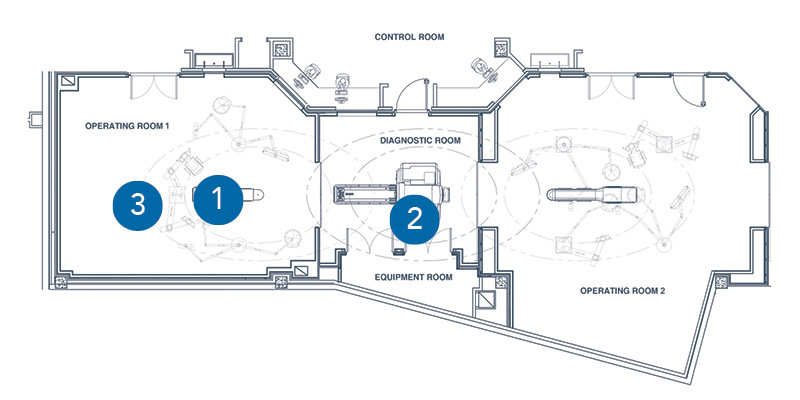 HARMONIZE SURGICAL WORKFLOW WITH HUMAN-CENTRIC DESIGN. Our team of consultants, designers and architects work closely with surgeons to integrate technology & design in harmony with your workflow. SAFETY FOR YOUR CLINICAL TEAM with training programs and a network of automated safety-checks. 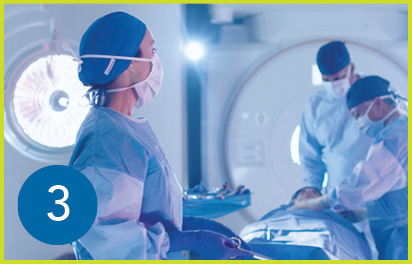 OPTIMIZED SURGICAL WORKFLOW with interconnected, user-friendly controls – and equipment positioned for MR-safety. CONSISTENT DIAGNOSTIC-QUALITY IMAGING PERFORMANCE with an RF-shielded environment and a stable, ceiling-mounted magnet transportation system. SUPPORT FOR THE FUTURE with a robust team of consultants and technicians, along with a single point-of-contact. PERFORM MINIMALLY INVASIVE PROCEDURES WITH GROUNDBREAKING INTRAOPERATIVE SOLUTIONS. Click the “SALES INQUIRY” tab to be connected with an IMRIS representative. Posted on November 9, 2017 at 11:23 am. We called it “The Big Think.” For 3 days, we put our minds together, brainstorming new ways to help our clients and re-thinking IMRIS’ role in the industry. At the event’s conclusion, IMRIS CEO Andrew Flanagan took the stage – congratulating employees for the company’s recent success while explaining what the “Human Experience” means for the future of IMRIS. Welcome to the new IMRIS. Welcome to the beginning. We’re here together. It’s an exciting time. I’ve been thinking about this day for over 2 years, before I ever joined. This is the day I saw. This is why I came here. You can do good while you do well. That’s what motivates me. That’s why I’m here. I think that’s why you’re here. And so, we’re doing this brand re-launch. We’re starting this company over. Based on success. And we’re stating publicly, to ourselves, that we’re going to do better than we have in the past. We’re going to aspire to achieve more. So, I want to talk to you about a few things. Why are we here? How are we doing? Where are we going? But they did. They invented it. They designed it. They built it. They sold it. And it worked so well that respected neurosurgeons actually put their reputations on the line to study it and publish the results: that it works better than the alternative. That’s not what happened. Deerfield believed in the technology. You believed in it. I believed in it. And we put ourselves to work. And for the last two years, we’ve been working. We’ve listened to our customers, and we’ve taken the tough feedback. How many of you think we’ve done the best job we could possibly do over the last eight years? Nope. Not one of us. We know that we have opportunities. And I give credit to you for being strong enough to ask our existing customers, people we know and have known for a long time, to go to them and ask, how can we do better? We understand. And we’re committed to finding out how we can make it right. The clinical team has been going in and having these conversations, and the response we get? We’re here because our technology makes a difference. Our customers value it. We don’t get to interact with patients, but I believe they value it. They have a choice – we don’t think about that, but they have a choice. Hospitals value that, and they brand themselves proudly as having our technology. For selfish reasons, to drive revenue, yes… But also pride. Our customers, our neurosurgeons, are deeply and profoundly professionally proud that they have IMRIS technology. We hear this time and again. We’re here because we have a job. We have a job that’s not done. So, we have to continue. The last two years, we’ve been quietly working. A friend of mine once told me that you don’t build a reputation by telling people what you’re about to do. You build your reputation based on what you’ve done. We’re doing this launch today because we’ve earned the right to say that we’re the leader. You’ve earned the right. It hasn’t been easy. We’ve gone through a lot of changes. Personnel, strategy, I’m flying coach… all sorts of things, right? It’s a sacrifice. We’ve done that together. You don’t know this, but I’ve seen the collaboration go from this, to this. It seems so simple. You don’t really notice it. You’re just in the normal course of interacting with people working together, but you’re working together in a different way than you worked together 18 months ago when I arrived. That’s paid off. It shows up in the 39 quality improvement team projects that we’ve identified, that hang outside the wall, that we’re funding. That make us better. The reason we’re focused on those projects is because we know, you know, we can do better. That’s our job. That’s our job in front of us. Our customers know we can do better. And when we point to those quality-improvement team projects and tell them we’re working on this, we’re telling them, “We hear you.” It’s important. That’s a fact. It’s a statement. It’s an activity we’ve done. That’s how you build your reputation. So, how are we doing? Well, we’re here on a two-year anniversary. And I’m happy to say that we’ve announced publically, that we’ve just finished in August our second consecutive year of profitability as a company. Okay, so what does that mean? Literally, we’re stable. Right? Chris, are you happy? Hey, Chris is happy, I’m happy. Right? So, cash is at an all-time high. Backlog is strong. Bookings are ahead of last year, and growing. Our forecast for next year – continued sunshine. Right? Clouds part, sun shines, crops grow, that’s our story. So, what are we doing with that money? We’re putting it back to work. We’re funding the QATs. We’re hiring engineers to re-engineer products: coils among them, cable, covers. Many of you know that. We’re also building new products. Siemens has a new “Vita” product – we’re now working with them on hanging the new Vita. That’s what we do. 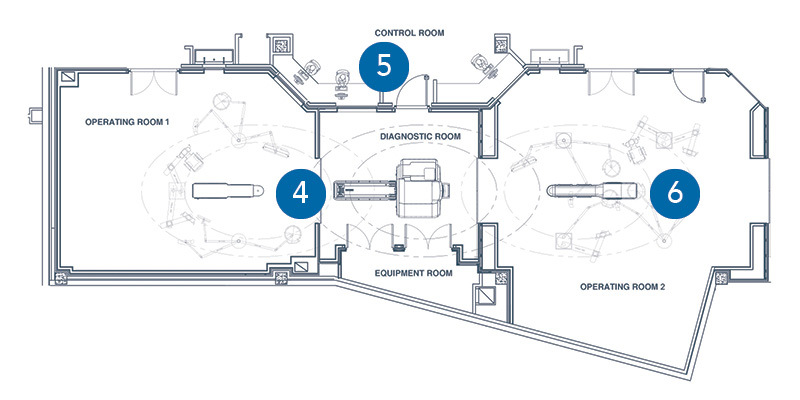 We’re inventing new technology, like the TXRX coil, that doesn’t exist in the world. That’s what we do. It’s our job. So, we’re lucky. We have a commitment to the human experience that drives us to say, “What matters? Let’s focus on what matters.” You’re talking to each other, which helps us prioritize. I’m not the one with the answers. I say all the time, “I don’t know.” And in case you haven’t figured it out, that’s actually a true statement. I’m counting on you to say, “No, this is the problem. We think this is the solution, but we’ll work together to figure it out cross-functionally.” I love that. Because, in the end, I just get down to, “How can I help you?” not “What’s the answer?” Because I’m not qualified to give you the answer. But I can help you. I can help fund it. I can support it. I can go out to work with customers and partners and take down barriers: I can do a lot of things. But I can’t do the important things. Which is to understand the problem and figure out a solution. That’s where you come in. So, “how are we doing?” My first measure is, “How are you doing?” So, show of hands? Who thinks we’re doing well? That’s awesome! So, listen – you know from these town halls that I do this on a regular basis, and when we started, it was kind of “ehh.” First, you were a little rough. But you were honest with me. That’s what I want from you. So, I believe from an employee perspective, we’re on the right track. I’m super excited about the people we’re bringing in, and I’m incredibly excited about the collaboration. That has to be number 1. Number 2, we’re doing very well financially. That just gives us the resources to continue our research, and innovate, which is our job. We have some things on the drawing board which we’ll talk about next year, so we have to keep a little bit ahead of everybody, but in between then and now, we have some real solutions that are going to make a real difference for our existing customers. And I’m incredibly excited about that. And I know some of you are excited about it too, because you get to work on new projects. How are we doing with our partners? Our brand is growing. Our customers and our prospective customers are coming to us, and I see this. In addition to growing our technical team, our clinical organization, we’re growing our sales force – in North America, very excited to see new faces here – we’re growing our marketing department. We are putting money to work. It’s an investment. It means we have confidence and we believe. That’s really the key. So these are facts. These are statements. These are historical comments. That’s why I’m excited to be here. And the reason that I’ve been waiting two years to be here, at this point in time, is that I don’t believe you talk about things until you’ve done them, until it’s in the bag. That’s when it’s time to say, “Yeah, we did that.” Everything aside of that is work. “We aspire to”, “we’re trying to”, transparency, hard work, hustle – that’s how you win. I love winning. But on the road to victory is a competition. And we are competing. I’m excited that this is the team that’s on the field with us. That’s the way I feel. The net of it is, we have a bright future. Primarily because, when you think about what we’re doing from a human experience, and you start thinking about who we impact, you realize that we have a lot of work to make things really perfect. We can do a lot of things. Look at the innovative companies that are cropping up with minimally-invasive and non-invasive technologies. “IMRIS, there’s an issue with one of our customer’s hooks. They wanted to have another cable, it’s extra long for one of our innovative partners, and the partner couldn’t get it.” So, what happened? Our R&D team jumped in and built an extra-long cable, so that our customer could use that minimally-invasive technology to serve their patients. Did we have to do that? No. Was it our job to do that? No. Was it the right thing to do? Absolutely. And we did it. And I’m proud of that. And you know what? He didn’t even ask me. I heard about this project halfway through, and I’m like “Woah woah woah woah, what is this? I’m protective of R&D. What’s going on around here?” I heard the story and I’m like, “Nice job!” Great story, great answer. Right? That’s what we want. Increased empowerment. Faster decision-making. More resources for some of these projects that we think are really cool. We’re going to be doing some things over the next 12-24 months that are really going to change our industry. Now, the only way to do it, is to take care of our current customers. We’ve got to go in and keep taking the hard messages. We have to do better in how we’re delivering our products: shipping, manufacturing, designing. We have to help our installation team and project management teams get these things through the door. And that’s going to happen with collaboration and communication. We cannot stop. So. As we sit here and think about where we are, I’m really happy. And I want to congratulate all of you on a tremendous job over the last two years. You really deserve it. We’re here to celebrate. And you should feel good going home. Being over here for the next few days, we have work to do, talking about our future, so we’re going to have a fun few days. And I also want you to have confidence in where we’re headed. I want you to own it. My expectation of you, is that you own the vision of IMRIS. You own the focus on the patient, the neurosurgeon, their family, the human experience. If you want to know how I feel about something, think about how it would impact the humans involved. Your colleagues. The neurosurgeon. Surgical staff. The patient. Their family in the waiting room 100 yards away. Stay focused on the people we impact, and we’ll win.